On a trusted recommendation, I had ordered a yard of 10-ounce Hand Waxed Cotton Canvas from A. L. Frances Textiles on etsy, which just so happened to come 60" wide - more than generous for my need, but I'm hoping to continue to dabble with the canvas, making a few more items. As I do when trying something I'm not familiar with, I went slowly, step by step. Due to the heavy and stiff nature of the waxed cotton, I left out the suggested batting and quilting, and that was a fine (and pretty obvious) decision. Otherwise the construction was relatively straight-forward, tho I did use a jean needle with heavy duty thread threaded in my machine and 50wt in the bobbin, and that combo worked like a charm. Already, the pouch has a 'used' look. That happens naturally as it is handled, and just adds to its appeal. It took unzipping it and seeing the lining before it dawned on hubby that his new bag was handmade. When I just asked him what I could say about what he thought about the bag I made him, he said simply, "I like it!" I'll take it. It has such a great aesthetic! I hope it holds up well, although I'm sure you will be more than able to make another version if/when needed now. 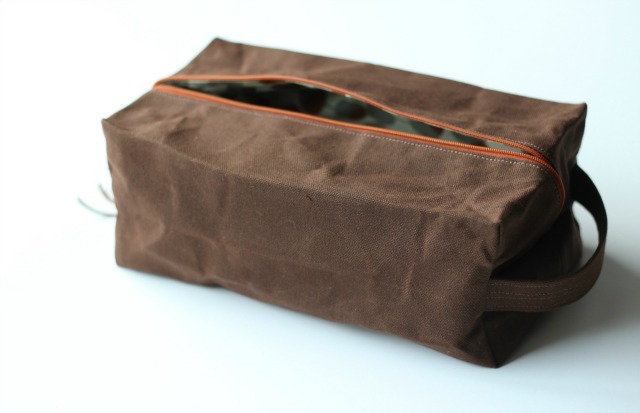 The orange is a great contrasting color to the waxed cotton canvas you ordered. I think it's great! it's hard to come up with things to make for the hubbies. this is perfect! This is great! 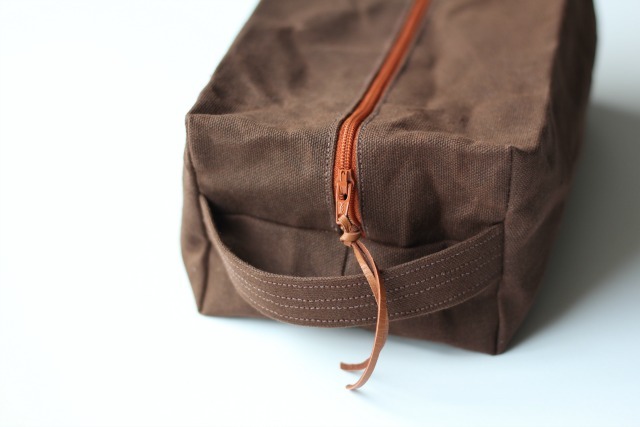 Love the waxed cotton look for this bag and I'm sure it will get a lot of use in your travels next year! Can't wait to see what you do with the extra fabric! It's tough to come up with things our guys really want. Well done, and it looks great. 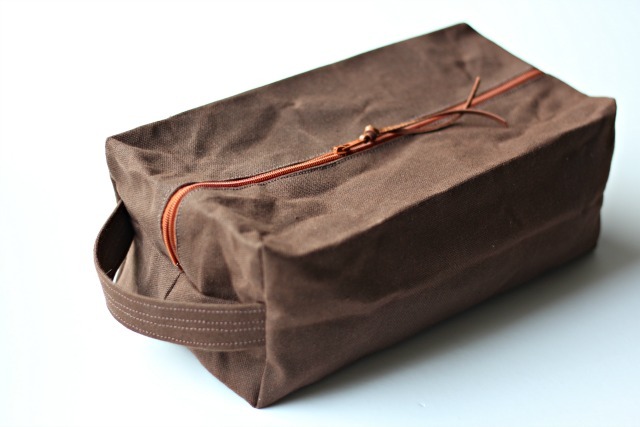 It's a very handsome dopp kit. Thanks for sharing it! Great minds think alike! I have that very same fabric from that very same shop sitting on my cutting table right now waiting to be made into the very same dopp kit for my future son-in-law! Thanks for the preview! Love it! I made an extremely similar pouch for my brother for Christmas, using waxed canvas! They turn out so nice. Although, I also put tabs on the ends, too, in addition to the handle. That bulk was a little too much, i think - my bernina was not very happy. I switched to the Juki and managed to get the ends stitched closed (I just hope they hold). I do have to admit, though, that even though I liked the creases, I used the hair dryer on it after it was finished, to get rid of the creases and give it a "newer" appearance to start out with.